This article was originally published in The Washington Informer. Oh, how you loved to do that. It started with spider-legged people and crooked houses. As you got better, you replicated and created worlds, invented characters, and expanded your tool use. Even today, with sharp pencil or fine pen, you can still make a respectable doodle; in the new book “Encyclopedia of Black Comics” by Sheena C. Howard, you’ll see how you’re right in ‘toon. One-hundred and four years ago, the country was captivated by a cat and a mouse. The artist was a black man named George Herriman who was the first major cartoonist of color. He would be far from the last. Today, countless Black cartoonists, inkers, illustrators, and writers toil behind-the-scenes to create comic strips and comic books, as well as TV shows and movies. In this book, Howard celebrates the firsts, the bests, the noteworthy and the historic. In the early days, for example, many comic writers worked through the Black Press, including Jackie Ormes, “the first published female African-American cartoonist.” Ormes was the creator of Torchy Brown, a strong Black cartoon woman; and fashionista Ginger, whose little sister Patti-Jo offered wisecracks. In 1947, one of Ormes’ characters was made into an “upscale” doll; in 2014, Ormes was posthumously indicted into the National Association of Black Journalists’ Hall of Fame. In his afterword, comics writer-editor Christopher Priest points out that, to many African-Americans, the Man of Steel isn’t Superman, he’s “SuperWhiteMan.” That’s just one reason, as Priest indicates, that a book like this is needed. The other reasons fill up these pages with a wide range of biographies, achievements, and examples of many cartoonists’ work, in bite-sized articles that make quick reading. While there’s a chance that you’ve heard of many of the people included in this book, author Sheena C. Howard didn’t just keep things familiar: she dug back into history for several of her profiles, and she also includes people who are on the periphery of — but important to — today’s comic book world. 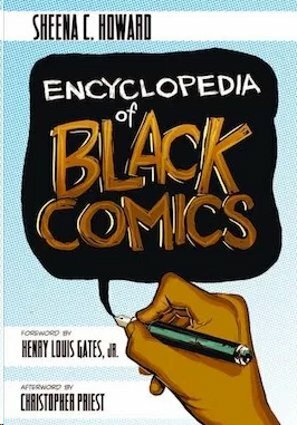 Quick-minded readers may note some absences inside here, but “Encyclopedia of Black Comics” is a good start for this genre. For those who love the funnies, cartoons, or pen-and-ink art, this book will be a big draw.